Here you'll be able to view a selection of new 9 seat minibuses all available for sale or lease. If you'd like to know more about minibus leasing just follow the link, and you're not looking to buy a new 9 seat minibus, you can also use the top menu above, the search function to the left or follow the links for used 9 seat minibuses for sale (or 8 seater minibuses if you're in the taxi trade) and see our great selection of 9 seat wheelchair accessible minibuses. We've negotiated great discounts with all manufacturers with a particular strength in Ford Transit and Peugeot Boxer minibuses. 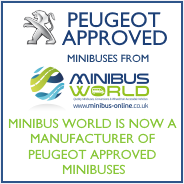 We can nonetheless supply new minibuses from any manufacturer either factory built by them or manufactured or adapted by our highly skilled coachbuilding engineers. We're used to dealing nationwide with customers as far as the Isle of Wight right up to Stornoway on the Isle of Lewis, and like to think we go the extra mile to help our customers get a great quality product and service. And if you need any help or assistance just give us a call and we'll help you find the right minibus for you. Please call a member of our friendly sales team on 01782 444 289.